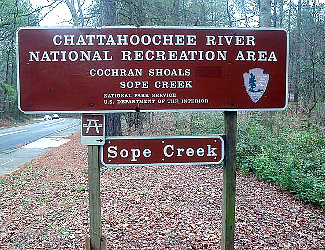 Sign for the Sope Creek area of Chattahoochee River NRA. Courtesy National Park Service. Source: NPS 2018 Visitor Attendance, Rank among 378 National Park Units. One Day Park Pass - $5.00 collected at parking areas. Yearly Park Pass - $40.00. Summer - This is Georgia, so expect hot and humid with daily highs in the upper 80s and low 90s most days. Winter - Mild with highs in the 40s and 50s. In both seasons, temperatures on top of the mountain will be several degrees cooler. Dress accordingly. 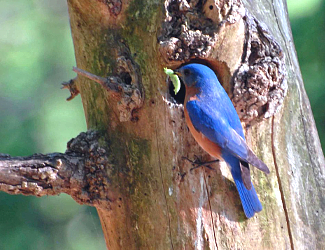 Photo above: Eastern Bluebird along the Chattahoochee River. 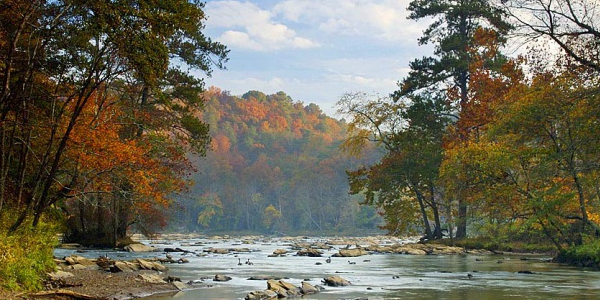 Right: Chattahoochee River in the fall. Photos courtesy National Park Service. For forty-eight miles from Lake Lanier to the suburbs of Atlanta, the fifteen land units of Chattahoochee River National Recreation Area wind along that river and its banks, providing a respite from the busy byways of the burgeoning city for hiking, rafting, and history. Yes, much of the history in this area of north Georgia has been paved over, but its still there. And with the establishment of the park in 1978, you get the chance to recreate amongst the area where Sherman marched to take the city. Who'd have thought that progress would provide a different sort of siege one hundred years later in suburban subdivisions, but hey, that's progress. But in areas such as Bowman's Island, Settle's Bridge, and McGinnis Ferry, or the ruins at Roswell Mill and others, you still get the chance to see the progress of that history and take a hike or a float. It's a history of native American heritage, prosperity in its many mills prior to the Civil War, the Civil War battles nearby and mills destroyed by the Union Army, and subsequent rebirth into the suburban outreaches of the Atlanta environs. 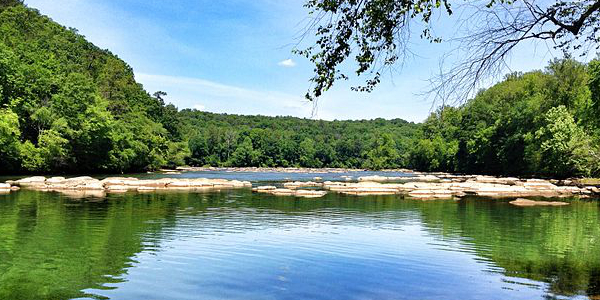 The Chattahoochee River itself is much longer than that encompassed by the National Recreation Area today. It flows for four hunred thirty miles from the southern Blue Ridge Mountains in Chattahoochee National Forest before emptying into the Gulf of Mexico. The NRA park contains only forty-eight miles of it. Indigenous history reaches back to 1,000 B.C., eventually naming the river Chattohoochee, a Muskogean word meaning rocks-marked. The Muskogee (Creek) and Cherokee territories were divided by the river. They were removed from all of it during the Trail of Tears treaties and forced removals between 1820 and 1832. This led to white settlement north of Atlanta and the construction of various mills to harness the power of the Chattahoochee River and ferries to cross it. The Marietta Paper Mills, Akers Mill, Ivy Mill and Allenbrook House were examples of prosperity reaching toward Atlanta, some of which became conquests during the 1864 Atlanta Campaign march of Sherman's troops. Ivy Mill was destroyed during the march with its workers (women) sent north until the end of the war. The Allenbrook House remains on the Ivy Mill site. During the Civil War, Johnston's Confederate troops built thirty-six shoupades (fortifications) along a River Line of the Chattahoochee, to forestall Sherman's advance. They were complex and impressive, but they didn't work against the superior numbers of Union troops heading south. 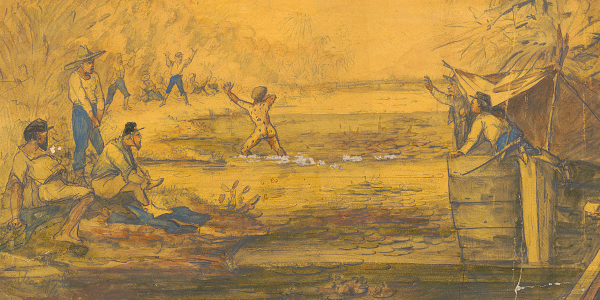 Photo above: Drawing of Civil War soldiers bathing in the Chattahoochee River, July 1864, Adolph Metzner. Courtesy Library of Congress. Below: Chattahoochee River at East Palisades, 2012. Courtesy Wikipedia Commons. The park was established in 1978 as predominantly a recreation place, and boy, are there a lot of opportunities to do that. At each of the fifteen land units, there are plenty of hiking trails at a variety of lengths and difficulties. There are also lots of trail markers along the way, whether that be in the northern part of the park at Bowman's Island or all the way south at Palisades or Paces Mill. For those who want to get wet, or at least close to wet, you can raft, canoe, kayak, and fish in a small boat (no jet skis) up and down the forty-eight miles of Chattahoochee River from sunrise to sunset. Night boating is not allowed. The river is stocked with trout and contains twenty-three species of game fish. In 2012, the Secretary of the Interior announced that the Chattahoochee River would be designated as the nation's first National Water Trail. Cycling is allowed on park roads, but only on park trails in the Cochran Shoals and Palisades area of the park. Chattahoochee River National Recreation Area T-Shirts and Souvenirs. Official gear from America's Best History. 1. Take a float. Whatever method you like to get on the river, outside of a jet ski, you can ply the water of the Chattahoochee River in your kayak, small fishing boat, canoe, or raft. There are no boat rentals within the park itself, but nearby there are outfitters that will rent you a canoe, etc. The river is predominantley calm, except for days when Buford Dam is letting water, but there are shoals and those dam release days, so be careful about water that might be past your expertise. 2. Take a hike. Cochran Shoals is a popular place to hike with a three mile fitness trial, but there are trails all over the fifteen units. You can even walk to history in Palisades where the Akers Mill ruins conjure back pre-Civil War era prosperity that did not last long after the war. Akers Mill was closed by 1889 after bankruptcy of a decade before. Ask at the Visitor Center about the ruins of the many mills that dot the park; it's a historic journey all on its own. 3. Participate in a ranger guided walk or talk. These occur in various parts of the park, including Sibley Pond and Sope Creek, with unique campfire talks and night walks. Check at the Hewlett Lodge Visitor Center for dates and times. 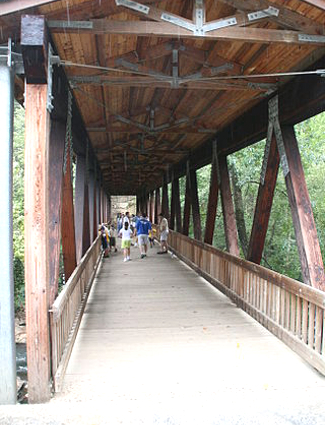 Photo above: Covered bridge at the Roswell Mill Ruins section of the park. Courtesy Wikipedia Commons. Hewlett Lodge Visitor Center at Island Ford - This is the park headquarters in the historic Hewlett Lodge, built in 1935 for an Atlanta attorney and subsequently used as a Baptist retreat. There's a book store here, plus park rangers with orientation, information, and maps. Chattahoochee River Environmental Education Center - Located between Jones Bridge and Holcomb Bridge (City of Roswell), the Environmental Education Center in Johns Creek, Georgia, hosts school field trips and special events. Chattahoochee Nature Center, north of the Gold Branch section of the park in south Roswell, is open daily. Additional fee required. It has a Discovery Center, gardens, the River Boardwalk, and many special events. 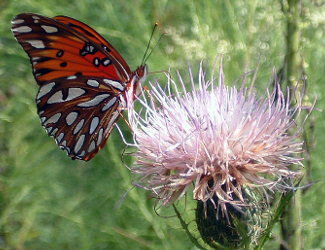 Photo above: Butterfly, Gulf Fritillary, in the park. Source: National Park Service. Chattahoochee River National Recreation Area is a long ribbon park, forty-eight miles from Buford Dam at Lake Lanier to Atlanta. It can be accessed at many points, including fifteen land units of the park. The physical address is 8800 Roberts Drive, Sandy Springs, Georgia 30350, which is the Visitor Center at Island Ford housed in historic Hewlett Lodge. This is north of the city of Atlanta in the central part of the park. 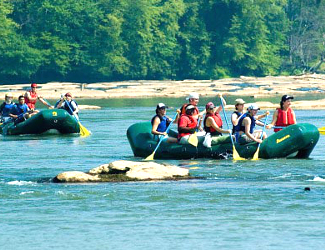 This Visitor Center is open year round 9:00 a.m. to 5:00 p.m.
Photo above: Rafting on the Chattahoochee River. Courtesy National Park Service. There are no camping or lodging units within the park itself, but you are in the suburbs of Atlanta, so many of the towns along the way contain a variety of lodging choices. Check out Expedia or one of the other travel sites or the visitor bureau of the area for lodging choices that suit your needs. 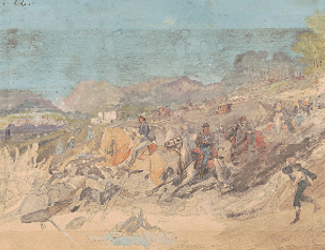 Photo above: Watercolor drawing of the Battle of Peach Tree Creek on July 20, 1864, 1864, Adolph Metzner. Courtesy Library of Congress. 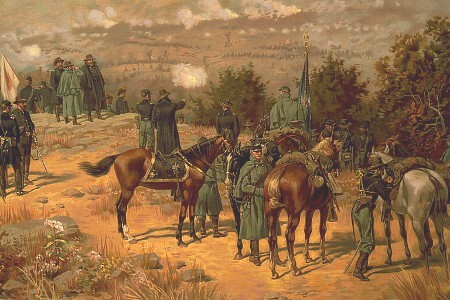 The Battle of Peach Tree Creek, a tributary of the Chattahoochee River, was the first major battle after the retreating Confederate Army had been pushed south across the Chattahoochee River on July 8 by Union troops.